More than a third of America's bridges are considered substandard--either structurally deficient, functionally obsolete or both. 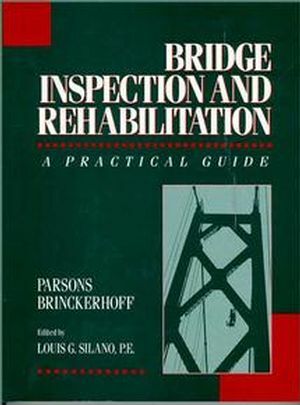 Offers first-rate, practical guidance regarding the inspection and rehabilitation of aging bridge infrastructure including all elements involving structure, various materials and design types. Features seismic retrofit and coverage of environmental issues. Each chapter is written by an authority on the subject. Contains top-quality, detailed line illustrations plus photographs of actual rehab projects. About the editors LOUIS G. SILANO, P.E., is a Senior Vice President and Technical Director of Structures with Parsons Brinckerhoff. His award- winning projects include the world's largest three-span stiffened tied-arch bridge, Fremont Bridge in Portland, Oregon, and New England's largest suspension span, the Newport Bridge in Rhode Island. Mr. Silano is a Fellow of the American Society of Civil Engineers and serves as a member of the Advisory Board for the Center for Construction Research and Education at the Massachusetts Institute of Technology. ARNOLD C. HENDERSON, PhD, is a Supervising Editor at Parsons Brinckerhoff. Bridge Inspection (N. Feuer & R. Little). Concrete Box Girders (J. Murillo, et al.). Steel Structures (J. Swindlehurst & F. Parkinson). Cable-Stayed Bridges (J. Murillo & J. Englert). Seismic Retrofitting of Highway Bridges (T. Jackson). Maintenance of Traffic During Inspection and Rehabilitation (R.Robison). Environmental Controls Related to Bridge Rehabilitation (E.Sela).